It looks like bulls and bears battle it out on Dalal Street in the month of February, which is usually marred by Budget volatility. Historical data shows Sensex gave positive returns in February in 5 out of last 10 years. 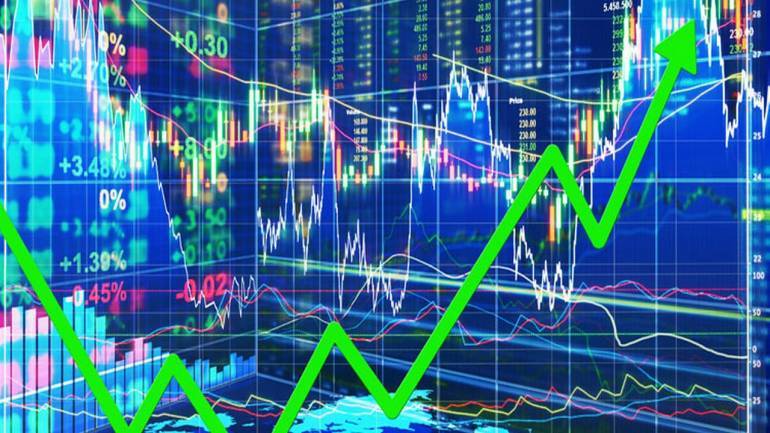 During the last 10 years, S&P BSE Sensex rallied the most in February 2014 rising 4.5 percent, followed by a 2.6 percent up move seen in 2012, and 2.1 percent gain in 2017, data collated by Ace Equity showed. On the other hand, in past 10 years, Sensex fell the most in 2016 when it plunged over 7 percent, followed by 4.8 percent drop in 2018 and 4.6 percent fall in 2013. 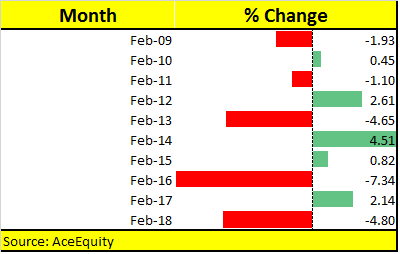 This month, the sentiment on D-Street has been positive from day 1 after the Interim Budget when Nifty rose beyond 10,900, which is a strong sign as it has put bears on the back foot for now. Two big events that will chart the direction for markets in the coming days are RBI Policy review and the final leg of the December quarter earnings. But, volatility will remain high as we inch towards the general elections. “In the near-term i.e. till the run-up to the elections, we have a positive outlook on the market. Till date, the Q3 earning results are on expected lines and is expected to be neutral for rest of the season. However events related to IL&FS, DHFL, Zee Group and political developments are likely to keep the market nervous/volatile,” Sumeet Bagadia, Executive Director, Choice Broking told Moneycontrol. “From our research desk, we are anticipating a change in the policy stance of the RBI to "Neutral" from "Calibrated Tightening" in the upcoming RBI Policy meet. This will pave the way for an interest rate cut in subsequent policy meets. Q4 earning, election results and full budget in July would be the next drivers for the equity markets,” he said. In terms of technical outlook, most analysts feel that Nifty will make a dash towards 11,000 in February 2019. However, for the bulls to remain control, the index has to stay above 10,980-11,000 on a closing basis. Resistance can be seen at 11,200-11,300. 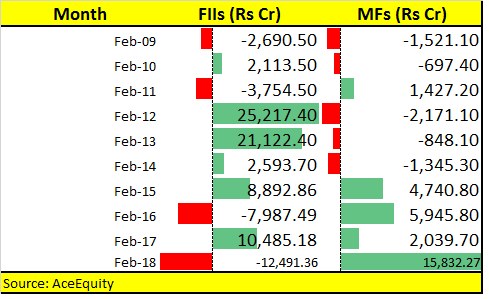 In terms of institutional activity, foreign investors (FIIs) have been more kind towards Indian markets as they poured money in six out of the last 10 years in February. FIIs invested over Rs 20,000 crore in 2012 and 2013 in February, followed by Rs 10,000-crore investment in 2017. They pulled out money or remained net sellers in Indian markets in Februarys of 2016, 2018, 2011, and 2009. “Prior to 2016 we have seen inflows by FII, but post demonetization and GST we have seen a mixed trend. However, we have seen domestic MFs aggressively pouring in money in the last four years. We will see mixed flows by FII’s, however, we believe MFs to continue to invest aggressively,” Atish Matlawala, Sr Analyst, SSJ Finance & Securities told Moneycontrol. Mutual Fund activity in February for the past 10 years suggest big money started flowing into Indian markets in 2018 when they poured in nearly Rs 16,000 crore. Data suggests MFs were net buyers half of the times in the last 10 years in February. Apart from 2018, they invested money in Indian markets in the year 2017, 2016, 2015, and 2011.